The United States Mint began striking the John. F. Kennedy Half Dollar in 1964, the year after the 35th President of the United States was assassinated. The new design replaced the 15-year run of Benjamin Franklin Half Dollars that started 1948. Typically circulation coin designs are to run a minimum of 25 years, but with sentiment running high after the assassination, Congress mandated the change. Collectors immediately hoarded the 1964 Half Dollars as mementos of Kennedy. Also, that year saw the last time they would be struck from 90% silver for circulation. 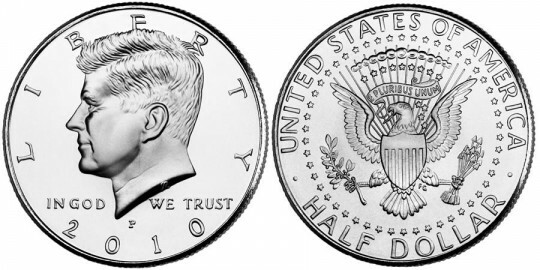 In 1965, the content was changed to only 40% silver. Finally, starting in 1971, circulation Half Dollars were struck from a cupro-nickel composition. The Kennedy half dollar has not been struck for circulation since 2002 due to low demand, but the Mint still strikes circulation quality coins on the normal production lines at both the Denver and Philadelphia facilities for collectors. These coins are available directly from the Mint in both roll and bag quantities. 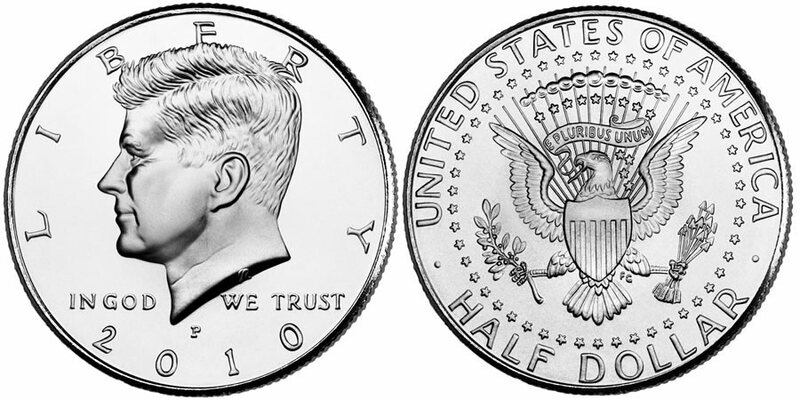 A portrait of John F. Kennedy is seen on the obverse. It was designed by Gilroy Roberts. Over Kennedy's head is the inscription "LIBERTY." Also seen are "IN GOD WE TRUST" and the date. The reverse was designed by Frank Gasparro to be reminiscent of the Presidential Seal. It shows a heraldic eagle holding a bundle of 13 arrows and an olive branch. The eagle is surrounded by a ring of 50 stars. The inscriptions of "UNITED STATES OF AMERICA" and "HALF DOLLAR" are shown on the reverse as well.